Let me begin by an informal description of the idea behind numerical integration. 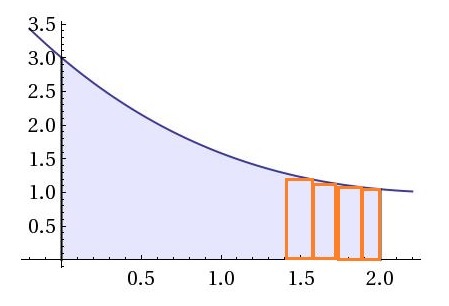 All numerical integration involves approximating the area under the function’s curve. 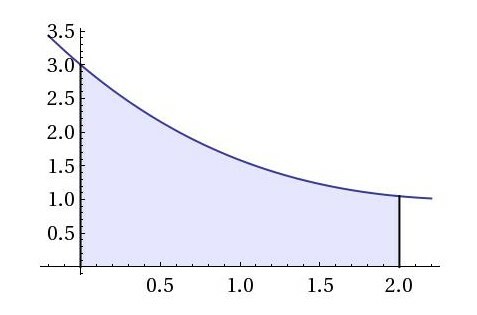 For example, Figure 1 is a plot of f(x)=2+cos(2*sqrt(x)) for x in the interval between 0 and 2. 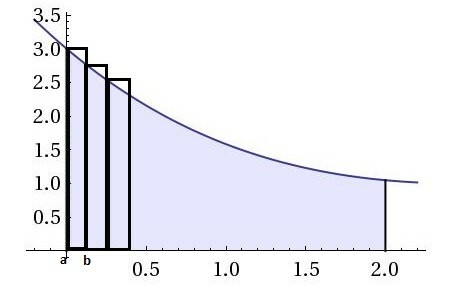 The area under the curve can be approximated in different ways. The simplest way is to break it up into many rectangles and compute their areas instead. Figure 2 illustrates this simple ‘rectangle rule’ approach, where I only show three rectangles. Clearly, for this function, the rectangle rule approximation will overestimate the area. However, this is due to the fact that I began to break-up the area under the function’s curve left-to-right. This means that the area of the first rectangle is calculated by evaluating the functions at point x=a, and scaling by the distance between a and b, where b is the starting point of the next rectangle. Was I to start from left to right, as shown in Figure 3, I would have underestimated the area. If you are thinking that some kind of average of the two methods can give a more accurate approximation, you are absolutely correct. This, in fact, is what trapezoid-rule approximation does. Also, it is clear, that the more rectangles are used to break-up the area, the more accurate is the approximation. It is probably a good time to formally define these numerical methods. In summary, the code defines an abstract NumericalIntegration class which has two members: a delegate to point to the function over which we need to integrate, an abstract Integration method which must be overridden by the deriving classes. The assignment of the integration parameters occurs through the base class constructor. However, in case of the SimpsonRule class, I override the definition of h.
Please note that for the sake of this comparison, I will not be attempting to estimate the number of rectangles or partitions needed to achieve some convergence criterion. However, I am still declaring eps in the base class constructor, which can be used for this purpose. The last function’s lower bound is set to 0.1 instead of zero. Table 1 summarises the results of each numerical integration rule. The last column shows the mathematical solution. Clearly, the Simpson’s rule is the most accurate here. I hope you’ve found this useful. In my next post I will examine various approaches to numerical integration of multi-dimensional integrals. This entry was posted in Numerical Analysis and tagged Integration, Numerical Analysis. Bookmark the permalink.